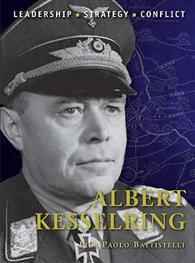 Although he is mostly remembered for his part in the campaign in Italy from 1943 to 1945, Generalfeldmarschall Albert Kesselring was also chief of staff of the Luftwaffe in 1936-37, playing a crucial role in the shaping of the service for the coming war. As commander of Luftflotte 1 in Poland and Luftflotte 2 in France and the Low Countries, he was responsible for supporting the armoured spearheads of the German Army as they undertook their Blitzkrieg campaigns. With the Fall of France, the Battle of Britain began and Luftlotte 2 was the main force in the air attack against the British air defences, with Kesselring planning many raids. Following the war Kesselring was tried and convicted of war crimes following a number of massacres of civilians in Italy. He was sentenced to death, later commuted to life imprisonment before being released on the grounds of ill health in October 1952. Here Pier Paolo Battistelli provides a detailed study of one of the most famous German commanders of World War II.